Ten hours total imaging time. M51 taken with the ZWO ASI071MC-Pro camera and the AT6RC scope. I managed to produce a neat image over the last two nights. 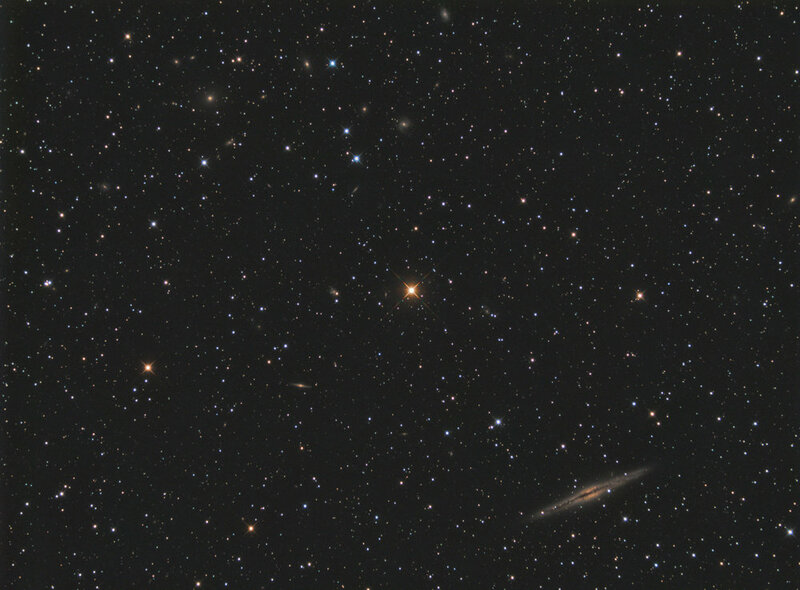 I centered the star HD14771 to place NGC 891 in the lower right and a galaxy cluster in the upper left. After two nights of imaging, I had around 13 hours. I placed it all together today. Turns out that the galaxy cluster was only a few of the total galaxies in this image. In all, there are 79. In this overlay, done in Observatory on the Mac, you can see all 79 galaxies highlighted. Here’s the scope that took the image. The AT6RC with CCDT67 reducer and ZWO ASI1600MM-C camera. This will be a general walkthrough of a typical capture session with my AstroTech AT6RC setup. This should be a good walkthrough for someone not familiar with the system to enable capturing their own images. However, I'm not covering equipment setup in this post, but might cover it in the future in another post. A few caveats with my particular setup. I break it down and set it up each night, so I require a new polar alignment before each session. My AVX mount doesn't fully support the park function in EKOS, so after a nights session, I cannot auto park, but others may have a mount that supports this feature. The first step in my process is to set up all my equipment, connect it to the Mac laptop and start with an All Star Polar Alignment (I can't see Polaris, so use this method built into Celestron mounts). After this procedure is complete, I load up Kstars, then press the EKOS button on the top bar to launch the EKOS capture system. I then press the connect button to connect to my equipment which I have pre-setup within EKOS prior to this nights session. The next part of the process is to open up the Mount Control module, and select "Mount Control" in the upper right of the window. This will open a small control pad with arrows, and a target search to move your mount. I'll press the search icon and type in a target name for a simple, easy to identify target for plate solving. Usually I pick an open star cluster for this process. I selected NGC129, then pressed the GOTO button to slew the mount to that target. 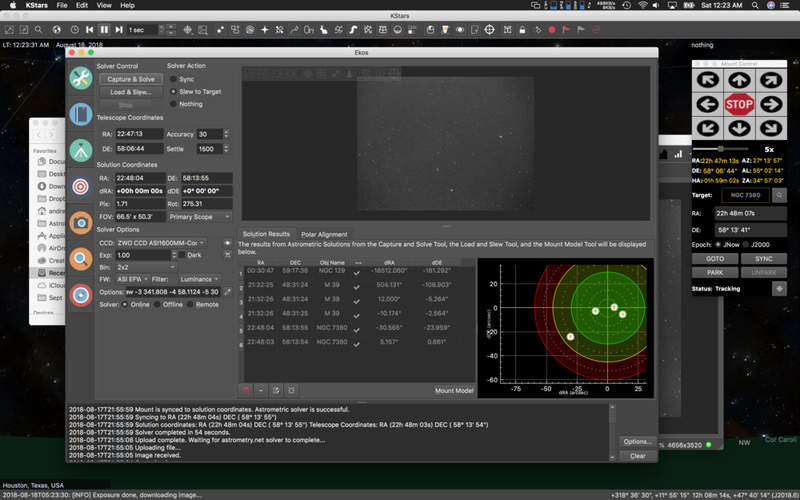 Now that I have slewed to NGC129, I press the Alignment Module tab to go through a plate solving process to improve my GOTO model inside the mount and EKOS module. The reason you want to do this is both so that you have increased slewing accuracy, and so that once you pick your target and slew to it, you have confirmation that this is in fact the target you picked. Additionally, this helps with the meridian flip and ensuring that once the mount has flipped, after passing the meridian line, that your target is picked up in the exact same spot it left off before the flip. Usually what I do in this first step is select Sync under Solver Action. Then I press Capture and Solve. All I'm doing here is plate solving the current position to tell the mount exactly where it's aimed. I had told it to aim at NGC129, but after this first solve, it shows the mount is way off. Not knowing for sure if this is an adequate target, I pick a new one using the Telescope Control and aim at M39, an open cluster. I once again set it to Sync, and press Capture and Solve. Now I'm fairly close to the target, but not quite in the green area. I press goto one more time now that my mount knows where it is, and then Capture Solve/Sync one more time and see if the last slew was closer to the target. Finally, we're in the green and good to go to our final imaging target for the night. I pick the Wizard Nebula NGC7380, and press goto. Once there, I perform a Capture and Solve/Move to target. This will perform multiple Capture and Solve routines moving the mount each time getting the target lined up perfectly. Once it's good the Capture and Solve process stops. Time to turn on guiding now. With our target picked, and GOTO plate solved to the target, we're ready to start guiding. This process is fairly straight forward. Dithering is turned on by default (you can check it by going to the options button in the lower right corner of the window). Now, we press capture, this shows you a single image from your guide cam. Select a star with your mouse, and it highlights with a green box. Press Guide, and the guiding calibration begins. This process is automatic, and you can watch the steps it's performing in the text window at the bottom of the screen. Once it's complete, guiding starts automatically. Now it's time to program our image sequence and start capturing. This is the final step for my process for an evening capture session. For the Wizard Nebula, I had planned on capturing it in bi-color over a two night period. Tonight is the first night, so I only plan to capture 7-8 hours of HA (Hydrogen Alpha filter), basically as long as I can before the sun comes up. Tomorrow night, I'll be capturing OIII (Oxygen III filter) for another 7-8 hours using the same routine. Since I have a cooled camera, the first thing I do here is set it's temperature to -15°C, and press the set button. The temperature quickly begins to lower. I can check that box next to the temperature, and the sequence will not start until the temperature has been reached. Next I plug in my Exposure time, I've set it to 180s, or 3 min images. A count of 240, which is more than enough to cover me to sun up. I make sure the type is set to "Light" for light frames (as opposed to dark, bias, or flat). I set the filter to H-a, then under file settings I name the files with a prefix, in this case NGC7380, and I check off Filter, Duration, and TS (Time Stamp) so that those are appended to the file names that I'm capturing. Now I've set all the perimeters for my sequence. I now add the parameters to the sequence que by going up to the top and pressing the "+" button. This adds it to the right into the que. If I lived in a dark area, and wanted to capture more than HA during the evening, I could change my parameters and add sequences for OIII, SII, or LRGB and just make sure that I only put enough time into each so that the sequence can finish by the end of the night. But since I'm in a light polluted area, I need as much time as I can spend on each filter, so I typically spend one evening per filter and get decent imaging results. We're done now with setting the sequence, and we're ready to run it for the evening. You'll press the play button at the bottom of the sequence window, and your camera will start capturing images until the sequence is complete. You can now tab over to the main window and watch the images roll in for the evening, or head to bed like I do, ready to wake up by sunrise and take down all the equipment before it gets too hot outside. (I live in the south where it's quite warm during the day). From here you can monitor the images that are being captured for the sequence you've plugged into the sequence editor. Below is the final processed image from two nights of imaging. I processed it with Astro Pixel Processor, PixInsight, and Photoshop on my iMac Pro workstation. Full equipment details can be found at Astrobin.